This season's books include: poetry collections: (Leigh Nash's Goodbye, Ukelele, Peter Norman's At the Gates of the Theme Park, Natasha Nuhanovic's Stray Dog Embassy, Priscila Uppal's Winter Sports Poems) and Imagining Toronto, Amy Lavender Harris' essays about how Toronto has been represented in literature. 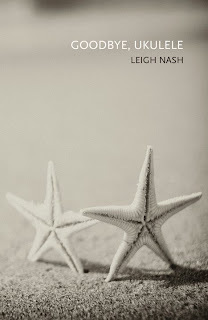 Here are two short poems which I particularly like from Leigh Nash's excellent debut, Goodbye, Ukelele. Linear A: Syllables slotted into weather-beaten tetherballs, hull-less ships docking in the dark. Linear B: Hands cradle a common suffix: frozen deer drown in metre. You can hear her keen ear for sound in the alliteration -- syllables slotted....weather-beaten tetherballs ...docking...dark and rhyme...weather/tether....dock/dark. There is beautiful allusive imagery throughout the collection and these two poems are no exception: Tetherballs with syllables slid into them, hull-less ships, frozen deer drowning in metre, and hands cradling suffixes. What is a hull-less ship? A wave? A quantity of moving water that could contain a ship? A frozen deer -- how does it drown, except through prosody? And poor common suffix, needing to be held. Which causes one to look for connections between these two poems. I won’t detail them all but there a rich source of connections, from the bipartite structure of the two sentences to sound relations between their elements: The d’s of docking and dark with the d’s of deer and drown. These two little poems are like fragments from a lost text, theoretical translations from an allusive tradition, cryptic yet concrete. Two cuneiform tablets to be savoured on the tongue. Like a ukulele. The other day, I woke and scrawled something down in my notebook. When I transcribed it and shaped it into a poem, I realized that it had taken its inspiration from Leigh's book and its lovely cover. The title of the poem is from the traditional song, sung by Stan Rogers, among others. in the morning, what was there? And, while we're talking ukeleles, here's a great song and video by CPUnit, featuring an electric ukelele. The song proper starts after the introduction explains why the video came to be made - for an electric ukelele manufacturer's contest.